Woke up this morning to low humidity and the temp around 60. It was wonderful and I even grabbed a cardigan because who knows what the a/c would be doing at work. I love this time of year since all of the fall patterns start coming out. It’s gotten me inspired to stop working on my patterns and work on some or the sweaters I have for myself. Working on an Icelandic one at the moment. My cat keeps trying to make a bed out of the body when I have it draped in my lap. Which is cute for a few moments and then I have to work it out from under him, which makes him leave in a humph. I have a feeling I’m going to have to store it somewhere special so it doesn’t get stolen. On another note got the final version of a new pattern that should be out Friday. Looking forward to it! This entry was posted in Knitting and tagged fall, kntting, weather on July 30, 2013 by admin. So getting started with the actual posts here. 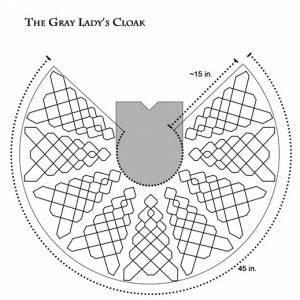 I figure that I’ll also do some of my older patterns but I’ll start with one that just came out which is The Gray Lady’s Cloak. I designed it for Interweave’s The Unofficial Harry Potter Knits. I didn’t notice this call for entries, but when the Jane Austen Summer edition for this year was combined with the fall I found out about it. Harry Potter, really!? In some way it’s great inspiration with all of the magical elements and memorable characters, but then it almost becomes open ended because there is soooooo much choose from that it was a little overwhelming for the first day to think of a design. The original yarn I swatched was Kidsilk Haze held double. What I got was Classic Elite Yarn’s Giselle which was a lot of the same features, but is thicker. I did try knitting it with two but it ended up super thick and stiff. Another change from my original idea is that I did it as a yoked cape versus pie wedges. Ultimately I am happy with the results. 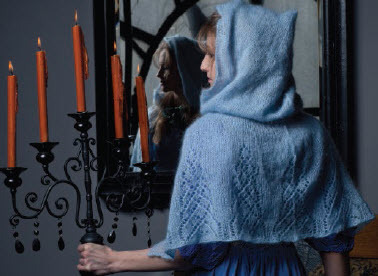 Personally, I think I’m making one for myself that is just the cape, and I may use it as an opportunity to try Rowans new Angora Haze. I have 3 more patterns coming out in the next month I look forward to sharing with you! 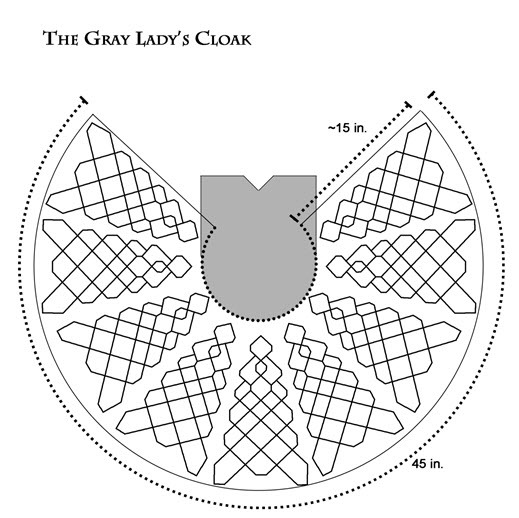 This entry was posted in Designs, Knitting and tagged Design, Harry Potter, Knitting, The Gray Lady's Cloak on July 25, 2013 by admin. So…. a new blog. I’ll be opening this up before I even finish my template so don’t be surprised if you come here and things look a little wonky ;). I hope to be sharing my designs and general thoughts on life. This entry was posted in Uncategorized on July 22, 2013 by admin.